When Oral-B emailed to ask if I wanted to try The Oral-B Deep Sweep Power Brush, I hesitated for a moment. I have a pretty set tooth cleaning regiment. Since I have made it this far without any cavities I feel as though any shift in my routine may cause problems. I have heard so many good things about electric toothbrushes so I decided to give it a try. 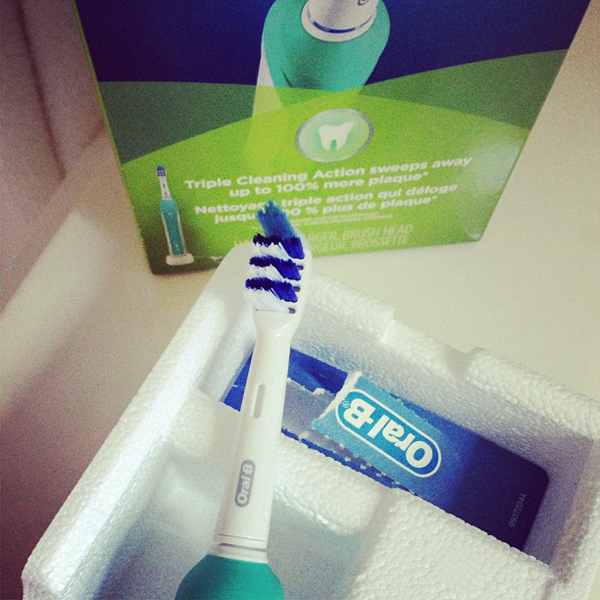 A few days later the Oral-B Deep Sweep brush showed up on my doorstep. The Deep Sweep has some impressive features. Three cleaning zones to remove 100% more plaque vs. a regular toothbrush. 20K pulsations plus 8,800 sweeps equalling 28, 800 movements per minute! How can a manual brush even stand up? When I first tried it the vibration took some getting used to. Try looking at your digital clock radio while brushing your teeth with an electric toothbrush. The numbers look weird. It feels so zippy. But it does feel like you are getting all your teeth. With a regular toothbrush I felt like I had to work so hard at it. The Deep Sweep felt more like when my dental hygienist cleans my teeth. They felt smoother, fresher and cleaner. And the feature I liked the most? The toothbrush gives you a signal every 30 seconds to switch quadrants! No more guessing if I have been brushing long enough or if I got to all my teeth! I love that! #spon: I'm required to disclose a relationship between our site and Oral Care Influencer Network. This could include the Oral Care Influencer Network providing us w/content, product, access or other forms of payment.